Summary: Today on “This Week with George Stephanopoulos,” SIM medical missionary Dr. Frank Glover, Jr. and Ambassador Robin Sanders, former ambassador to Republic of the Congo and Nigeria, discuss the threat of Ebola in Africa. 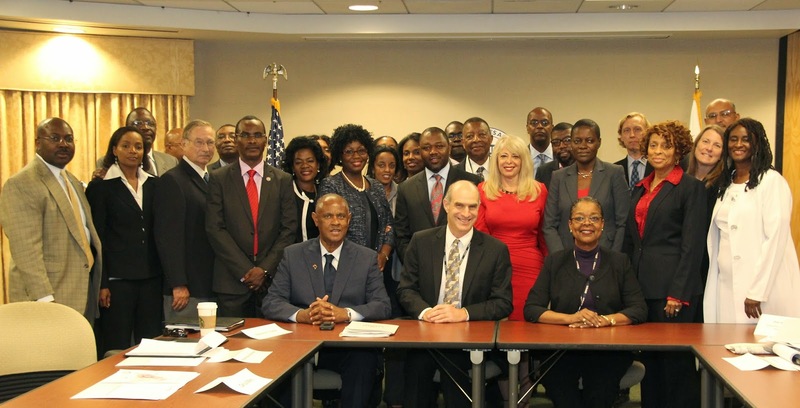 A 35-person delegation from the Constituency for Africa met today with senior officials from the United States Agency for International Development (USAID) to discuss opportunities for African-Americans and other Americans of African descent in assisting in implementing US foreign assistance programs. The CFA delegation was led by Melvin P. Foote, the President and CEO, and included a range of stakeholders from organizations, institutions, colleges and universities and from the private and entrepreneurial community. Dr. Sanders, FEEEDS-CEO, was a member of this high-level and important CFA-led and organized delegation. Leading the USAID team for the CFA meeting today was Mark Feierstein, the Associate Administrator and Oren E Whyche-Shaw, the Principal Advisor to the Assistant Administrator for the Africa Bureau at USAID. The CFA delegation was briefed on the success of the recent U.S.-Africa Leaders Summit; USAID’s response to the Ebola crisis; USAID efforts to promote STEM in Africa (Science, Technology, Engineer and Math); and a range of USAID efforts targeting the African Diaspora. Discussion topics included efforts to renew the African Growth and Opportunity Act (AGOA) and opportunities to expand trade between the US and Africa and within Africa; CFA’s efforts to launch and promote a STEM initiative in Africa; opportunities for African-American and Diaspora development groups to partner with USAID in Africa; and efforts to mobilize support for USAID and the development agenda in Africa. FEEEDS encourages support and attendance at CFA’s 2014 Ronald H. Brown African Affairs Series, which gets underway in Washington next week and runs from September 24 - Oct 7, 2014.